LANCASTER – A single engine airplane lost power as it was about to land at Fox Airfield in Lancaster Monday morning, according to a Los Angeles County Sheriff’s Department report. Around 8:57 a.m., the 42-year-old pilot maneuvered his small plane to land on Avenue F near 40th Street West, where it skidded, with no landing gear, for about 150 yards. The plane came to a stop in the graded dirt along the side of the roadway, with several feet of one wing sticking out onto the roadway. The plane was upright and intact, with minor damage to its undercarriage. Lancaster Sheriff’s deputies were on scene shortly after the plane landed. The pilot was not injured and there were no passengers. 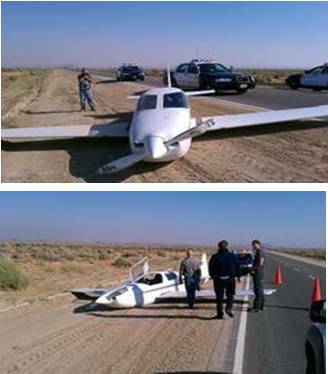 Deputies directed traffic around the plane until its landing gear was able to be deployed and it was towed to Fox Airfield in Lancaster.